If it a real fact-based news story, it will be available elsewhere on the Internet. No need to link to the Daily Mail. 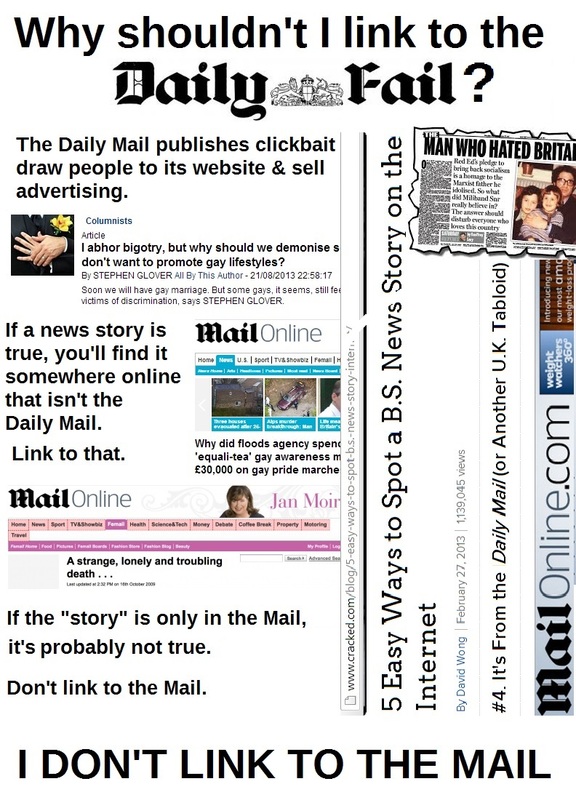 If it is only available in the Daily Mail, it is probably not true. No need to link to it at all. If it is a column that makes you angry just to hear about it and on reading it makes you want to spit bile and share the agony of having read something so hateful and so wrong, yes, that’s a strong part of the MailOnline’s business model, and if you link it to it, you are doing exactly what they hope you will do, providing traffic to their website and therefore revenue from their advertisers. Why do that for them? You may ask – why the Mail specifically? Because in my view, the Mail is the worst of the British media for simply inventing stories when it suits them: for turning their Mail Online website to make a huge profit for the owner. Muslims are not a majority religion in the UK, and mosques are more likely to be firebombed than churches. The most powerful and dangerous country in the world, whose religious extremism has caused more deaths than any other nation’s, has Christian conservatism at the heart of power, not Islam. The right-wing domestic terrorists of the EDL and SDL march against Islam: the BNP occasionally takes up pickets outside KFCs that provide halal chicken: we see a BBC Question Time panel debate veiled Muslim nurses for 20 minutes without ever asking themselves or the audience “has it ever happened that a nurse wanted to wear hijab on a ward”? Right-wing men go on rants claiming it’s a big feminist deal how Muslim women dress. (It is.) An anti-Islamic pressure group masquerading as a “student rights” organisation is funded by a neocon thinktank. And heavyweights like the Daily Mail and the Telegraph run media campaigns trying to convince people that it’s a very big deal if a shop assistant who prefers not to deal with wine or pork, has her religious preferences met with flexibility by her employer. Right-wingers who wouldn’t support LGBT rights or feminism against any Christian institution get all worked up over the hazards of “Islamic extremism” to women and to gay people. When you have a right-wing political movement trying to blame all the ills of the country on “immigration”, and presenting a persecuted minority as if they were a huge danger, what does this look like to you? Because I know what it looks like to me. In April 1989, the Sun published the infamous “The Truth” front-page slander of the Hillsborough tragedy and are still boycotted in Liverpool. It ought to have been a tremendous lesson to the tabloid industry that you can only go so far in peddling hate before you oversell it. 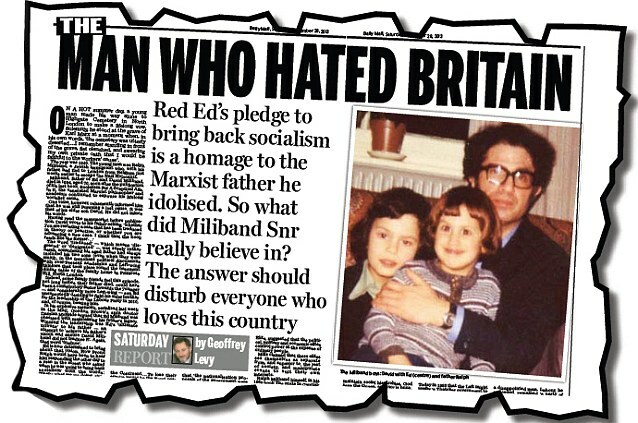 On Saturday 28th September, the Daily Mail published an article about Ralph Miliband. There were two problems with the article: the first, that it wasn’t true, was no different from any other smears the Daily Mail has cooked up in the past. The second, that it had been published purely to traduce a dead man because he was the father of the current Labour party leader Ed Miliband, was so clear that even the usual supporters of Daily Mail politics found themselves choking on it: of the entire Conservative cabinet, only Michael Gove – who used to work for Rupert Murdoch at the Times and whose wife writes for Paul Dacre at the Daily Mail – defended the Mail: every other Conservative minister from David Cameron downward admitted that if that had been his father, subjected to Daily Mail attack after his death, they’d… well… they wouldn’t have been happy about it. Contemptuously, the Mail – and all the Mail employees, from Paul Dacre downward – have refused to apologise, claiming they were entirely justified in their smears of Ralph Miliband.